Courtesy of Swift at Point of Interest! I've been having a lot of fun playing with the raw golden shea, and here's what I've done recently. I admit I have a thing about sugar scrubs - they're just so yummy looking and feel incredible on your skin! I scented mine with Lemon Curd and it looks like a tasty lemon pie! I take horrible pictures, so you probably can't tell how lovely it really is! Weigh the shea butter, emulsifier, oils and esters into a heatproof container and put in your double boiler until melted. Remove and add the rest of the ingredients. Mix well, then put into a fridge or freezer to solidify (the freezer is a better choice with unrefined butters, but since we're adding sugar to this, grains aren't really an issue!). When the mixture has a solid layer on top but some liquid underneath, remove from the freezer and start whipping with the whisk attachment on your mixer. Add your sugar - I like to use about 140% sugar, but it's your choice - and whip until it has almost doubled in size. Spoon into a container and enjoy! You can use any oils you like for the 45% oils in this. I chose mine because I don't use apricot kernel much, the fractionated coconut oil because it's very light feeling, and the C12-15 alkyl benzoate because it will make the scrub feel a little less greasy and it works as a fragrance fixative. You can use any oils you like - I like soybean for the phytosterols, Vitamin E, and linoleic acid or olive oil for the phytosterols, oleic acid (very moisturizing), and hygroscopic properties (it draws water out of the atmosphere to your skin). Feel free to leave out the silicones and increase your oils by 4%. I'd suggest using a light oil as a substitute. Wow, does this feel lovely. 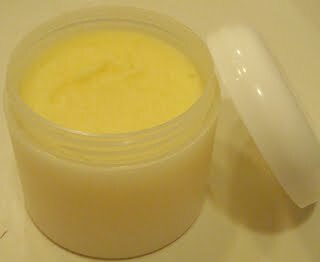 This shea butter isn't as greasy as normal shea butter, and it is stiff enough in the container to hold its shape without being a lump of sugar. I love this stuff, and I thought I'd share! Courtesy of Swift from Point of Interest! I normally make this recipe with regular cocoa butter, but the black cocoa butter makes it look so pretty - like a big chocolate bonbon - and it feels incredible. It melts much faster than regular cocoa butter, so the bar is a little softer than my normal bars, but it keeps its shape well. I was honestly surprised at how much more more cocoa butter was deposited on my skin after my morning shower - I felt moisturized until bed time! This is a 60 gram bar - it would normally last me three showers, but I think this one will only last two! If you want it to last longer, but still want the amazing moisturizing you get with this butter, I'd use 30% black cocoa butter, 20% regular cocoa butter, and mango or a harder butter at 20%. I'm planning to give these for Christmas with a drizzle of regular cocoa butter with pink or purple mica wrapped in a cellophane bag to make it look like a giant candy with a huge sign that says DO NOT EAT! I made mine in cupcake scent, but anything chocolately or sugary would be lovely - chocolate raspberry, cheese cake, cake - you get the idea. 2% wax of choice - beeswax, soy wax, etc. For candellia wax, please use 1% as it is very hard. If you leave out the silicones and/or sodium lactate, increase your oils by the same amount. Add up to 100% sugar, salt, seeds, loofah, and so on. It really is your preference. I like to use salt because it doesn't melt much in the hot oils. f you are using sugar, you may need to add more than 100% because the sugar will melt into the warm oils - if you can stand the waiting, let it cool a bit before adding the sugar. It will melt slightly, but not enough to be concering. Clay and jojoba beads will melt in the hot oils so you will need to let the mixture cool a lot - they really aren't a great choice here because you'll have to wait so long, the bar might actually solidify while you're waiting for the right temperature. Personally, I'd leave those for oil based or emulsified scrubs. I don't feel the loofah is a good choice for this bar as it's simply not scrubby enough, but some people like it, so I make the suggestion. I'm trying this in an emulsified sugar scrub next! 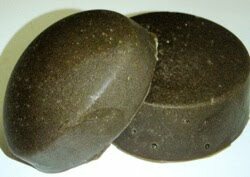 After the success that was the black cocoa butter salt scrub bar (above) - I thought I had to use this in my usual sugar scrub recipe. If you want to use this for a body scrub, start with 100 grams of sugar per 100 grams of sugar scrub. You can increase it as high as 200 grams for 100 grams of sugar scrub - it depends upon your taste (I like it really scrubby, so I go for 170 to 200 grams per 100 grams of sugar scrub.) 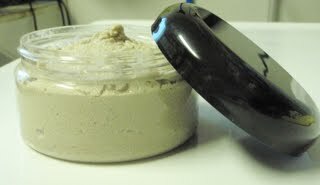 If you are using another exfoliant, you'll really have to play with it to see what you like. Weigh all ingredients except the fragrance or essential oil in a heat proof container and put into a double boiler. Heat and hold for 20 minutes at 70C. Remove from the double boiler and put into your fridge or freezer until it reaches 45C. Add the fragrance oil, then return it to the fridge or freezer to cool further. When the mixture starts to harden slightly on the sides of the container and gets a thick film on the top, remove it from the fridge or freezer and start whipping it with a hand mixer with whisk attachments or your Kitchenaid with whisk attachments. Whisk until it looks like vanilla pudding - this might take a little while - then add the sugar and whisk until well incorporated. Pour into jars and let sit until hardened. I like my normal recipe with regular cocoa butter, but this one is getting raves from me, my friends, and my family. I need to keep a regular supply of the black cocoa butter in my workshop!